Sunday, April 30th, 2017: Spring Trip 2017, Trips. I got a late start, and entered the mountains just as full dark was falling and all the stars were coming out on this moonless night. The military refueling flights were occasionally deafening as they droned though their long mechanical circles overhead, but they stopped at 10 pm. Snug in my sleeping bag, there under the glittering arch of heaven, I felt much more comfortable and at home than in my bed back in Silver City. On the first day, temperatures were mild, with alternating wind and calm, clouds and blue sky, and I hiked up to the Shade House. There, I strung my hammock and lay reading and watching birds and pollinators move among the nearby shrubs and boulders. The clouds, some tantalizingly dark, brought temporary humidity but no precious rain. I was plagued by gnats, but at least they didn’t bite. I hiked up to the seep and found the catch basin dry – something that only happens in the deepest droughts. The next morning I woke to a cold wind and put on layers of fleece before making breakfast and coffee. Discouraged by the drought, I thought of leaving and going elsewhere. But the sky cleared and I saw the big boulder pile 2 or 3 miles across the basin, where I knew there were inner chambers with shade from the full sun of afternoon and views out across the bajada. The walk across the bajada reminded me that this is a special place for plants. I found dense stands of healthy bunchgrass, and surprising groupings of very different plants living together in harmony, in a desert that’s more commonly known for plants that isolate themselves from each other with chemical repellents. Many were blooming, long after the “official” annual bloom, from the tiny annuals at ground level to the tall cholla cactus and creosote shrubs. And I came upon bees, butterflies, birds, rabbits and hares, all enjoying springtime on the bajada. That night it was so windy I had to anchor even heavy things down and turn my sleeping bag away from it, to the south. I could tell the wind was on the rise and planned to leave in the morning, discouraged by both wind and drought. High winds in the morning. I took my time packing up, and on the way out down the broad main wash, noticed a wedge of snow on Mount San Gorgonio, a hundred miles away through a haze of wind-raised mineral dust. Then, just outside the mountains, I unexpectedly came upon a vehicle driven by someone I only knew as a legend – the geologist who’d discovered this place and helped put it on the international map of earth science. He was bringing some young students out, hoping they’d like it enough to resume research out here. So I turned around and joined them, and the legend gave me some glimpses of an incredibly dynamic, and incredibly ancient, story. Here, the crust of the earth, then consisting of sedimentary – the limestones, shales, and sandstones of the Grand Canyon – and ancient metamorphic rocks such as gneiss – had been folded under unimaginable forces, and interpenetrated by younger granite rising from below, and the interfaces between the rocks were incredibly complex. In fact, much of the story remains a mystery today after decades of study. In this migmatitic exposure, beautiful marbles had been formed, and embedded with colorful skarns in reds and greens. Layer upon layer of granites and recrystallized carbonates that had flowed over and under each other repeatedly, to be eroded across eons and exposed here for us in frozen waves and thin sheets like iced cream. Almost two billion years of the Earth’s history we hiked over, up a few hundred feet of steep mountainside. The students hungrily scanned the rocks at their feet, but the legend kept redirecting their attention up to the deep blue of the sky behind the stony ridge, and to the special plants scattered around them, like the red Dudleya and the barrel cactus, that thrive on this particular substrate. And I pointed out my new obsession, biological soil crusts, which arise at the interface between rock and life. Easily missed knots of nondescript black matter in fissures of white stone. Subdued now in the drought, but ready to swell and glisten after a rain. Thursday, May 11th, 2017: Spring Trip 2017, Trips. In a large and complex range, with many interior basins, this is the largest: a valley eight miles long and four miles wide. And since the passage of the Desert Bill in October of that year, it can only be legally accessed on foot. But the barriers in the way of entering this remote valley are even greater. The Lost World is almost completely surrounded by eighteen miles of high, steep ridges and peaks. Its mouth is little more than a mile wide. That opening at the south end of the valley is two miles from the nearest legal road, a poorly-maintained track through deep sand. From the road, it’s a two-mile hike uphill across low desert through sparse creosote scrub. There are other points where a legal road approaches within two-to-four miles of the valley, but most of those approaches involve a strenuous climb over the intervening, steep, tall ridges that almost completely encircle the valley. Many years passed, in which I dreamed of somehow getting back in there. I remembered that in 1992, a friend who studies the wild mountain sheep had taken me in a helicopter over the north end of this valley, and across a deep canyon on the east side where I could see lush vegetation. He’d also given me a map of water sources that he’d made in a very wet year, and the map showed that even in a good year, the Lost World is devoid of water sources except in two places, both near the mouth of that canyon we’d flown over. So unless I visited after several years of heavy rainfall, I’d need to carry my own water for miles into the valley. And the warmer the weather, the more water I’d need to carry. The barriers to access, and the lack of water, stood in my way for over twenty years. It wasn’t until 2015 that I first set off to enter the Lost World, hiking up a smaller exterior basin on the east and over a high, steep ridge, to end up near the mouth of canyon we’d flown over. Unfortunately, the desert was still in a deep drought, and I had ended up hiking into a heat wave, so the springs were dry and I only had enough water to get back out. So I was only able to explore about two miles of the main valley floor. However, beyond my wildest expectations, I discovered potsherds, worked stone, and petroglyphs – prehistoric rock art of the Old Ones – showing that people had spent time over here, in wet years when there was reliable water nearby, probably near those very boulders. In 2016, I did an eight-mile round-trip hike from my land in the north, up to a ridge that overlooks a northwestern corner of the Lost World. There, I had a limited view of the valley’s eastern wall, including part of the area I visited the previous year. I wanted to go back, but there was a wall in my way. The routes I took in and out of the valley in 2015 were extremely rugged, prompting me to take a closer look at the alternatives. One was two miles to the south, but looked even more rugged on approach. Another was far to the west, and would involve a long hike around and over a narrow pass that opened into the lower, southwestern edge of the valley. Again, I would have to carry all my water. And this spring, I finally found myself in the desert again with a forecast of cool weather and rain, the best conditions I could hope for. I had a three hour drive to get near the pass, including about forty miles on paved highway, interrupted by several miles of detour on dirt roads, and ending on thirty miles of poorly-maintained or unmaintained, and heavily eroded, gravel, sand, and bedrock tracks. On the way, before I got to the really bad parts, I had to stop and deflate my tires for traction in sand. So I didn’t arrive in the mountains until early afternoon. Once I’d located a campsite, I did a two-mile hike to the mouth of Mesquite Canyon where I knew there’d be afternoon shade at the foot of a short cliff. There, I encountered abundant cottontails, jackrabbits, quail, and mourning doves, and anything red I carried was an endless curiosity for hummingbirds. By the time I returned to camp, heavy, dark clouds had formed over the northern part of the range. I gathered branches for firewood and grilled all the meat I had left from last week’s shopping. Just as I finished laying out my bedding, it began to rain. I quickly gathered my things up and retreated into the now-crowded cabin of my truck, where I watched and listened to heavy rain on the metal roof and lightning and thunder eight to ten miles to the north. It rained intermittently hard for about forty-five minutes. Then I unpacked all my bedding and laid it back on the wet sand. It was so windy, I had to turn my sleeping bag around, but after that, I finally got a good night’s sleep. I woke early the next morning, and was able to load my pack and start hiking toward the pass by 9 am. The weather was perfect for conserving water – it would be in the 60s all day. I figured I would aim to be back by 6, for a total of nine hours of hiking. Over open ground, I could theoretically make eighteen miles in that time, but I knew I’d be stopping a lot for photos and side trips. And “open ground” is misleading in desert scrub, where every dozen yards you need to detour around a sprawling creosote, catclaw, or cactus, around an even larger granite boulder or outcrop, or down into and up out of a deep wash with steep banks of loose sand. After the first mile of gentle uphill slope, I entered the pass itself, two miles of traversing across the foot of a steep ridge, with views of distant mountain ranges to the south between smaller, isolated peaks that form the southern walls of the pass. This pass is a really beautiful and interesting area in itself, but I was on a mission and didn’t linger much. Finally I came out into the southwest side of the Lost World, and rounded an outlying shoulder of ridge to get my first view to the north and the extent of the big valley. Both sides of the valley are scalloped by cross-ridges and tributary canyons, many of them sizable basins in themselves, but I intended to march north past as many of these as I could, to see how far up the main valley I could get in the time I had. Of course, the most thrilling aspect of visiting a place like this is the fact that you’ll be the only human in a huge area, perhaps the only human visitor in decades, and you will see no buildings or vehicles or ruins or any other sign of human life other than the prehistoric petroglyphs and tiny artifacts I found in 2015. 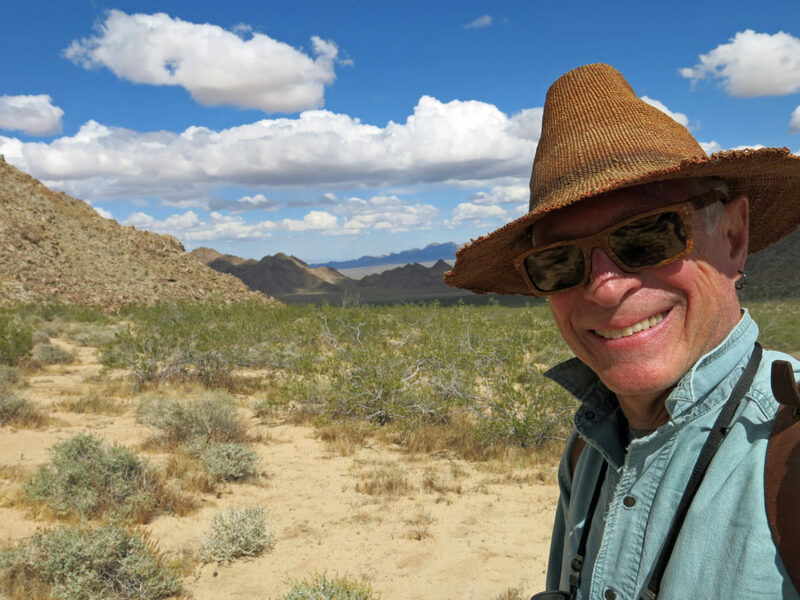 I hoped to find more rock art, so I did stop and explore any prominent outcrops or boulder piles along my way that exhibited desert varnish, the black bacterial weathering that provided a canvas for the Old Ones. In the end, I found no rock art – not surprising, since according to my biologist friend there are no springs on the western side of the valley – but I did penetrate to the northern half of the valley, where I had a view of the entire northern ridge line, including all the points where I’d looked down into the valley since 1994. What a glorious day! I found no shade on my route, but the weather was cool enough that I didn’t need any for a change. There were so many birds out, everywhere, following me, curious about what I was doing, making noise if they thought I was threatening a nesting area. By the time I had rounded that last shoulder of ridge and taken my pictures to the north, it was time to quickly grab a snack and immediately head back. My left foot and right hip were hurting pretty bad, so I downed a couple of painkillers as well. As glorious as the day was, and as beautiful as the valley and pass were, it was a fairly painful trek back. I figured my round-trip hike to have been about thirteen miles, the longest hike I’d done in seven or eight years, since my hip condition began to deteriorate, and I had surgery. By the time I returned to my campsite, the sun was going down, and I was exhausted, sore, and thirsty. But as I approached the back of my pickup truck, I heard a loud buzzing, and discovered that hundreds of bees were swarming the bed of my truck. I suddenly realized they’d been attracted to water that had pooled in the pickup bed from last night’s rain, since the truck was parked downhill on a slight incline. All my stuff was locked in that truck. What was I going to do? I knew they could be Africanized “killer” bees, which have been known in this mountain range for decades. But I was desperate. I thought if I could get into the truck somehow, I could drive up the wash so that the water would drain out, and maybe the bees would lose interest. I skirted the edge of the swarm to see if bees were moving around the doors. They were, but they seemed to come and go on the passenger side, so that I might be just able to race over, unlock the door, jump in, and slam it closed without any bees following me. I didn’t give myself time to think, I just set down my pack, took the field glasses from around my neck and set them on the sand, and pulled the camera out of my hip pocket and also set it down on the sand. My folding chair was leaning against the pickup bed, so I grabbed it and moved it away, careful to move slowly so I wouldn’t anger the bees. Then I watched the bees moving past the passenger door, and made my move when I saw a short break in their traffic. I made it, and got the door closed without letting any bees in! But before leaving that morning, I’d packed the truck willy-nilly with all my unrolled bedding and everything else I didn’t want to leave outside, so now I had to pack everything into the narrow space behind the seats, and awkwardly maneuver over the brake and shift lever into the driver’s seat. Finally, I drove a hundred feet away, up the main wash, left the truck, and cautiously walked back over to the campsite to get a drink of water from my pack. But now, a second group of bees had separated from the main group and were swarming all over my pack, my camera, and my field glasses! My heart sank. I was so tired, so thirsty, so sore. How was this going to end? I walked away up the wash, a hundred feet from the swarm, and sat down on a rock ledge. 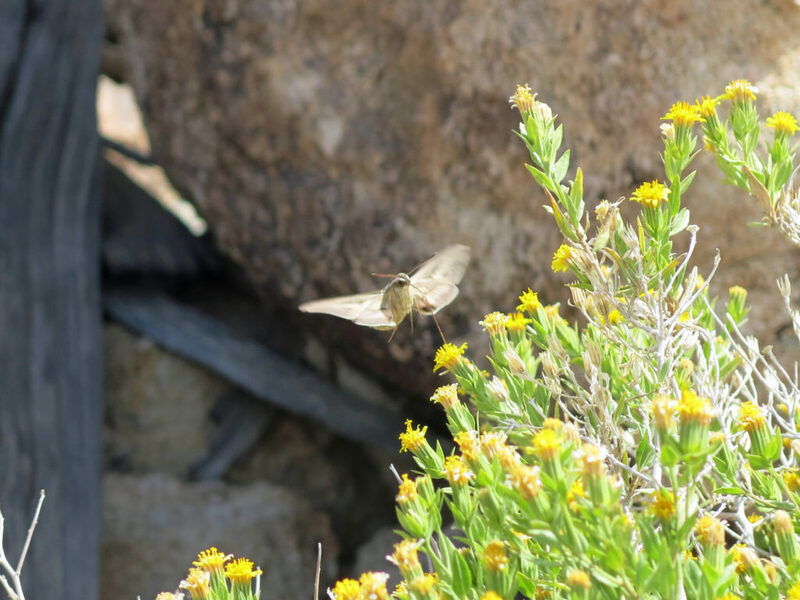 But soon, a bee followed and found me, so I moved another hundred yards out into the desert. I was alone in the middle of nowhere without water, food, or shelter, all of which the bees now controlled. And even way out there, another bee tracked me and started harrassing me, so I had to get up and keep moving. I made a great circle out into the desert, thinking I’d come up on the truck from the opposite direction and see if they were still swarming the bed. On the way, I remembered that beekeepers use smoke to control hives, and I remembered I had a lighter in my pocket. I knew that dead yucca blades generate a lot of smoke, and although there were few yucca in this basin, I’d seen one up the wash, so I detoured over there, pulled off some dead blades, and scrounged some dead grass for tinder. Soon I had a smoking torch. By the time I returned to the truck, there were only a few, sad-looking bees crawling along the bed. The sun had dropped behind the western ridge and it was noticeably cooler. When I walked over to camp, I saw only a few bees, so I started a fire in last night’s fire ring. The wind was blowing north, so smoke from the fire would keep any remaining bees away from my pack. And soon, the remaining bees were gone, and I was able to get a drink of water out of the pack, and to drive my truck back over. I figured that with the area in shadow, it had probably gotten too cool for the bees, and they’d headed back to their hive, which was probably up Mesquite Canyon, or even over the high ridge in the next drainage. I could probably have just kept walking circles out in the desert and waited for them to leave. But the experience had really spooked me, and turned me off camping in this area. So I packed up and drove outside the mountains onto the vast western alluvial fan, where I camped that night at lower elevation on desert pavement, among very sparse scrub, with a sunset view of bright sand dunes and distant, dark ranges. In the morning, there were just a few bees left crawling feebly around the bed of my truck. I planned to spend the day and night in town resting my foot and hip and restocking for my next attempt to reach the Lost World via an eastern approach. I had so much business in town, I didn’t get back to the mountains until mid-afternoon the next day. On the way down the long dirt road past the eastern side of the range, I saw trucks blocking the way ahead, and came upon a young woman urging a tortoise across the road. She turned out to be a recent biology grad consulting for the gas company, doing tortoise training for their pipeline maintenance personnel, big guys who hovered awkwardly in the background. I encountered two more tortoises on that road – probably a record – because the tortoises know when rain is coming, and emerge from their burrows to drink. Eventually I reached my destination and scouted a place to leave the truck opposite the canyon I was hoping to use as a route to the Lost World. Then I loaded my pack and headed up this basin I’d never explored, toward a spring I’d long heard about but never visited. It turned out to be a mostly overgrazed bajada of soft sand undermined with animal burrows, a slow and uncertain walk uphill, but it was a cool day and rain clouds were gathering all across the desert. I was carrying a rain shell and a plastic tarp to throw over my pack, and as always was actually hoping for rain. I’d started at 2 and wanted to be back by 6 to look for a campsite, so I could theoretically cover as much as eight miles round-trip. At the head of this basin is a giant formation of granite that looks like the Dark Tower of Barad-Dur in the Lord of the Rings, abode of the Evil Lord Sauron, so I came to think of this area as the Canyons of Mordor. The ungrazed lower part of this basin was rich in biological soil crusts, and as I got farther in, I came upon some of the biggest silver cholla I’d ever seen. Then I encountered more birds, who teamed up and challenged me in groups, flying straight up and flapping their wings at me, showing off their dramatic black-and-white banding. Finally I reached the head of the basin and dropped down into the main wash, which curves out of sight below the towering ridge line, which is dauntingly stony. I’d seen lots of old cowpies out in the basin, and now I came upon some abandoned plastic piping, indicating that ranchers had fed the spring water down for their cattle at some point. Then I came around a bend of the wash, saw a big boulder covered with desert varnish, and realized some of the patterns on the rock had been made by the Old Ones. I was surprised, since friends who knew of my interest had visited this spring and hadn’t said anything about the art. I continued up the wash, and found lots more abandoned piping, and thickets of invasive tamarisk I had to fight my way through. The canyon became steep, narrow, and winding, and there were many pouroffs and blockages of house-sized boulders that had rolled down from above, in addition to thickets of catclaw and tamarisk. The surrounding slopes, of dark, ancient granite, are topped by many strange pinnacles that our imagination can easily make into recognizable forms. But it’s a world of stone, even more so than other parts of the range. This is supposed to be an important spring, but the higher I climbed, the more I despaired of finding water. And the ridge above wasn’t getting any closer, it was just getting steeper and more forbidding. This would not be a good route into the Lost World. Then clouds began pouring over the peaks, and I knew it was time to turn back. A few drops of rain were beginning to fall and I was getting cold. The Eye may be extinguished, but Barad-Dur still stands! Biggest silver cholla I’ve seen! Before our god gave us dominion and our scientists and engineers achieved it with the miracles of physics and chemistry – the towering cities, the superhighways, the power plants, the machines, the toxic chemicals and plastics, and the internet – there was an earlier world of Nature, in which the Old Ones lived lightly on the Earth, leaving only these faint traces on the rocks in a few remote places our destructive power has so far failed to reach. By the time I got back to the truck, it was raining lightly. I was anxious to get to my favorite campsite – in fact the only campsite – on this side of the mountains, but it was a long stressful drive at low speed over deeply eroded dirt and rocks and uphill through deep sand. It began to rain harder, and when I finally reached the site, someone else had claimed it with a big truck and loads of gear. I wasted some more time looking in vain for another site, then I gave up, turned around and drove back down to the main gravel road out of the mountains. I headed north, through increasing darkness and intermittent heavy and light rain. Night was falling and the storm was spreading, and the road had high banks with no place to pull out. I reached a high area of desert pavement beside a smaller mountain range and was finally able to pull off under a transmission tower. Someone had camped here and left their fire circle, but it was under a damn powerline and transmission tower, and after seriously considering it, I realized I wasn’t set up to cook dinner or lay out my bedding in the rain, a situation I’d never had to provide for in the past. This was a new experience and nothing to really complain about – being driven out of the desert by rain! I still had to stop somewhere and re-inflate my tires. I did that in the dark, in heavy rain, beside the road. It takes a half hour. I reached town, and a motel, by 9 pm, under continuing heavy rain in the desert. What’s next? Well, it would be cool to explore all those side basins and canyons. But that would take multiple days, and too much water to carry. If only we’d get several wet years in a row, to recharge the fracture zones in the granite and get the springs going again. Then maybe there’d be water on the east side, and I could actually live in the Lost World for a few days. It can’t hurt to dream! Saturday, May 13th, 2017: Spring Trip 2017, Trips. Then, a few days ago, I visited perhaps the most interesting rock art in the Mojave desert, in a lush canyon oasis on the sacred mountain of the Colorado River tribes, where their creator god began his journey down the river. During my visit, I encountered the kitsch of white peoples’ religion, I picked up their abandoned plastic trash, and I convinced an Anglo family to stop desecrating the site with their loud pop music. “Sacred Area: Take a moment to listen to the land.” So the young Anglo couple with kids entered the canyon with their radio blaring Top 40 hits. A lot of good meat on that chuckwalla’s tail! Wednesday, May 17th, 2017: Spring Trip 2017, Trips. From the Mojave Desert, I traveled northeast to the Colorado Plateau, where I camped among pinyon and juniper near the rim of a sandstone canyon. My campsite faced the setting sun across a broad, shallow basin blanketed with sagebrush. In the morning, I drove farther into the back country, passing prairie dog colonies with their popup lookouts, and followed a trail down from the top of a mesa to a rimrock escarpment. Hundreds of feet below, a creek opaque with grey-green sediment raged, carrying water down from snow on distant peaks. Near the end of the escarpment, ancient people had made pictures in the sandstone. These pictures are attributed to farmers from a thousand or more years ago who lived in earth houses, whose remains are found all across Utah, often under modern towns and cities. During completion of an interstate highway, a boy who lived in a canyon in its path told his father about ruins he’d seen on a hill that was being attacked by bulldozers. Eventually, the bulldozers were temporarily halted and a team of archaeologists surveyed and excavated the hill, finding the largest known village site of the mysterious farmers who are believed to have created much of the prehistoric rock art in Utah. After the village site and its house ruins were excavated and artifacts removed, construction of the interstate highway resumed, almost completely destroying the hill and its ancient village. In partial compensation, the state opened a museum to store and display artifacts and educate the public about the vanished community. Anglo settlers have always known this canyon to be rich in rock art. Apart from the rock art attributed to them, the ancient farmers are known for their earth houses, which archaeologists misleadingly call “pit houses.” This term reflects the Anglo-European bias in favor of technologically advanced societies that attempt to “rise above” nature and dominate the earth. 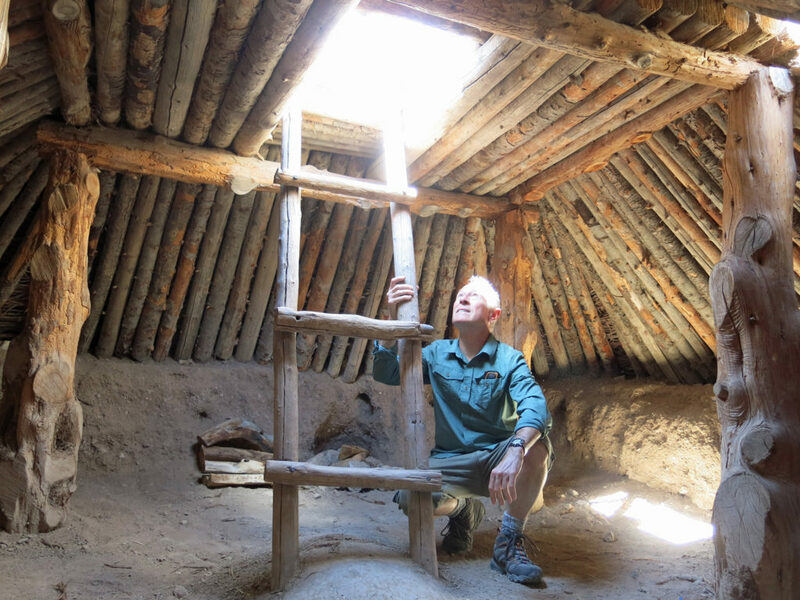 Anglo archaeologists considered the ancient farmers more “primitive” than their Anasazi neighbors who built cliff dwellings far above the ground; in comparison, these primitive farmers seemed to be living underground in pits like animals. But as I noted last fall in Closing the Circles, these “pit houses” were actually mostly above-ground, and both spacious and comfortable. Unlike the “pueblos” of the Anasazi and modern Indians of the Southwest, these earth houses were not defensive, indicating that their populations had achieved a peaceful existence. The boxy, densely populated “pueblos” with their dark, cramped rooms would more accurately be termed “fortified apartment blocks,” built and inhabited by a society that was out-of-balance, and fearful, like ours. But most importantly, the earth houses of the ancient farmers were supremely adapted to their environment. These people did not try to engineer their habitat on an industrial scale like the Anasazi – or like our own society. Of course, the best evidence of this society’s success would be seen not in their houses and other artifacts, but in themselves, their gardens, and the health of the natural ecosystems they inhabited, all of which seem to be lost to us now. But maybe not completely lost – modern tribes may be directly descended from the ancient villagers, and recent excavations in other parts of this area are showing that some of the ancient farmers’ fields and irrigation networks were used continuously into historic times, when they were appropriated by early Anglo settlers. As the museum exhibit asks, “What can these ancient people teach us?” Unlike us, they put the well-being of the community above that of the individual. They lived in harmony with nature. And instead of trying to control nature, they adapted their way of life to changing conditions in a challenging environment. As a result, they thrived for a thousand years in this place, sustaining a larger population than we do there, even with our advanced technology and vast wealth. But, also unlike us, they sustained their traditions of hunting and gathering, so that when conditions changed dramatically, instead of fighting nature, they could temporarily set aside their village farming way of life and became nomadic foragers and hunters. For me, the centerpiece of the museum was the multi-media story of a farmer girl who had died at the age of seventeen. From her damaged skeleton, forensic scientists had reconstructed the girl’s appearance and her likely life history, archaeologists had added cultural and societal context, a sculptor had created a life-size likeness of the girl, and a girl from a nearby modern tribe had voiced her long-forgotten story. This skeleton of a 17-year-old girl from 900 years ago was uncovered by a backhoe digging for a natural gas pipeline. The girl’s remains had already been severely damaged by previous highway and railroad construction. Anglo homesteaders came in advance of the modern nation, but within a century the nation had caught up. Its bulldozers razed the hill of the village, and its freeway paved the floodplain where the villages kept their farms, so that now the valley and its once-bustling community is merely a passing glimpse from the closed windows of the racing metal boxes rushing urban Americans from city to distant city. I was told in the museum that Native Americans in the surrounding areas were outraged, and a native elder placed a curse on the Department of Transportation, leading to a series of mishaps and tragedies, and pleas from the government that the curse be removed. And later, laws were passed to prevent this sort of cultural destruction. But laws can be overturned, and arrogant, domineering nations seldom last as long as this community of People Who Adapted. On my way home, I stopped in one of my favorite mountain ranges, at the far eastern edge of the territory of my favorite Indians, the heirs of the ancient farmers. I pushed my little truck dangerously through a raging stream to a clearing under tall green cottonwoods, below a cliff of layered sandstone. When I got out of the truck, I discovered the ground was covered with shelled pine nuts. The modern Indians had used this very spot to process their harvest, a harvest they’ve sustained for thousands of years!